This podcast is something different from the regular Interview podcasts that I do. 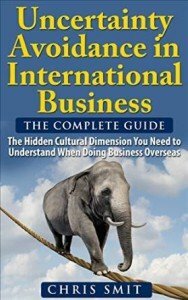 I wanted to pay more attention to Hofstede’s fourth and most difficult dimension: Uncertainty Avoidance. Time and again explaining this dimension is difficult to do. A lot of people link it only to official rules. But that is not enough. Uncertainty Avoidance covers a whole lot more. Listen to this podcast and find out what else is linked to this complex cultural dimension. If you want to learn more, why not get the complete book on Uncertainty Avoidance. Exclusively available on Kindle by Amazon. Click here to get it now.